Periodontal disease (also known as gum disease) is a chronic inflammatory condition in which plaque bacteria accumulate below the gum line. 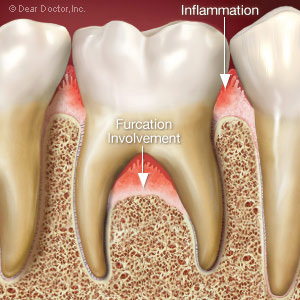 Over time, the inflammatory response to the bacteria can cause the eorision of gum tissue and supporting bone. If left untreated, periodontal disease can lead to tooth loss. The good news is that through such treatments as scaling and root planing, Dr. Cristoforo at Dental Implant and Periodontal Speacialists can help you reduce the inflammation in your gums. There are a few things you can do at home as well to help reduce inflammation in your mouth and throughout your entire body. Foods rich in omega-3 fatty acids - including oily cold-water fish (salmon, tuna, herring, or sardines) and walnuts - have been found to reduce inflammation. The body doesn't produce these acids naturally, and they can come only from consuming certain foods. Additionally, antioxidant-rich green tea has been shown to reduce inflammation in the body. People who exercise regularly demonstrate fewer incidences of periodontal diseasethan those who do not. While moderate exercies may help reduce inflammation in your obdy, extreme exercise (such as running marathons) can actually increase systemic inflammation. Exercise also reduces stress, another risk factor for periodontal disease. Stress has a negative impact on the body's ability to fight infection and inflammation. It's a very good idea to discuss your exercies plain with a health professional to ensure that it's a good fit for your lifestyle. The American Academy of Periodontology (AAP) recommends brushing twice a day and flossing once a day as a part of a daily oral health routine. 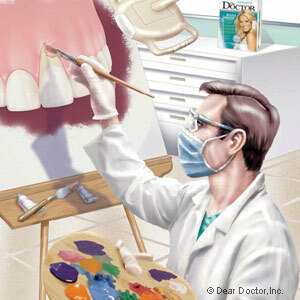 You should also undergo a comprehensive periodontal evaluation every year to assess the health of your gums. If periodontal disease does develop, your periodontist Dr. Cristoforo can develop an effective treatment plan for your unique needs. Research suggests that periodontal disease shares an association with systemic conditions such as diabetes, cardiovascular disease, pregnancy complications, and rheumatoid arthritis. The AAP recommends that if you are living with any of these conditions, it is important to notify your periodontist about your medical health history. Likewise, if you are diagnosed with periodontal disease, you should make your physician aware and create an informed care team that can manage both our oral and physical ailments effectively.